At a time when no woman, particularly an African-American woman would have dreamed of becoming a pilot, on June 15, 1921 Elizabeth 'Bessie' Coleman, a fiercely independent woman became the first female of African-American descent and the first woman to hold an international aviation license, a feat that is quite amazing at the dawn of the Art Deco era. On the occasion of Black History Month, her remarkable short-lived pioneering role as a pilot deserves to be given her due recognition among the amazing women of the century. Against all odds “Bessie” was determined to succeed as a pilot and despite her youthful zeal she was confronted and rejected by typical prejudices of the day. In the beginning no flight school or flight instructors, including black male pilots, would accept Bessie as a student because because she was African-American and female. Putting adversity aside Bessie pursued her dream. She accomplished the impossible and broke barriers both as a woman and an African-American. Bessie was bravely independent and a woman, who decided, against all odds, that learning to fly provided an exciting challenge. WORLD WAR I PILOTS’ STORIES Elizabeth “Bessie” Coleman (1892-1926) knew that there wasn’t much of a future for herself in Waxahatchie, Texas, where she grew up the tenth of thirteen children to sharecroppers George and Susan Coleman. So at the age of twenty-three seeking better opportunity she moved to Chicago, Illinois where she lived with two of her older brothers. She found steady work at the White Sox Barber Shop as a manicurist, which was quite fortuitous because in this male dominated circle she would hear about aviation and flying from the young pilots returning home from World War I. She became enthralled with their stories and therein was planted a seed that would grow her determination to become a pilot. One of Bessie’s brothers had also served as a pilot, and he would tease her about the fact that French women had careers and could even fly planes. The idea that French women were pilots was just the kind of catalyst that was part inspiration and determination to o put her on another path toward a career in aviation. LEARNING TO BE A PILOT The problem quickly became apparent that she could not gain admission to American flight schools because she was black and a woman. Bessie must have launched a convincing campaign to reach her career goal. Encouragement came by way of Robert S. Abbott, founder and publisher of the Chicago Defender, which as part sponsor he would capitalize on her flamboyant personality and her beauty to promote the newspaper. Financial backing came forth from other sponsors too including Jesse Binga (a banker). Bessie first took French language classes at Berlitz in Chicago, and fully confidant in her language skills she traveled to Paris on November 20, 1920. THE FRENCH CONNECTION Upon arrival in the City of Light Bessie quickly enrolled in the prestigious Ecole d’Aviation des Freres Coudon at Le Crotoy. She learned to fly in a Nieuport Type 82 biplane, with a steering system that consisted of a vertical stick the thickness of a baseball bat in front of the pilot and a rudder bar under the pilot’s feet. 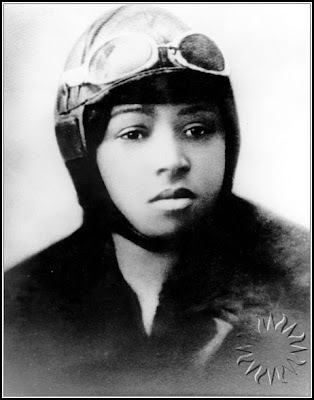 On June 15, 1921 with skills acquired at the Ecole d’Aviation Bessie became not only the first African-American woman to earn an international aviation license from the Federation Aeronautique Internationale, but the first African American woman in the world to earn an aviation pilot’s license. Determined to polish her skills, Bessie spent the next two months taking lessons from a French ace pilot near Paris, and in September she sailed for New York. POLISHING HER SKILLS When Bessie returned to the United States, she discovered that she was unable to make a living as a civilian aviator, the age of commercial flight was still a decade or more in the future, but there was a demand to see her fly and in order to become a “barnstorming” stunt flyer, and perform for paying audiences, she would need more advanced lessons, so back she went to France to take advanced courses in aviation, visited the Netherlands to meet with Anthony Fokker, one of the world’ most distinguished aircraft designers, then headed to Germany, where she received additional training from one of the Fokker Corporation’s chief pilots. Bessie was ready and the world was waiting. QUEEN BESS When Bessie returned to the United States she became a media sensation and was admired by both blacks and whites. It was a monumental recognition for an African-American woman who had emerged from a small town to the heights of celebrity. She made her first appearance in an American air show on September 3, 1922, at an event honoring veterans of the all-black 369th Infantry Regiment of World War I. The show billed “Queen Bess,” as she was known, as “the world’s greatest woman flier.” Later she returned to Chicago to a large and enthusiastic crowd at the Checkerboard Airdrome (now Chicago Midway Airport) with a dramatic, daredevil performance including figure eights, loops and near-ground dips. However, she would not perform at events unless the audience was desegregated. With the admiration of cheering crowds people flocked to see her fly and to hear her speak in cities across the country. BESSIE’S FLIGHT SCHOOL Bessie never lost sight of her childhood vow to one day “amount to something,” and indeed she did just that as a pioneering pilot. Her wings took flight in yet another direction to open a flight school what would admit women and African Americans. She worked tirelessly to raise money and sponsors to reach that goal but tragedy struck on April 30, 1926, when Bessie, at the age of thirty-four, was in Jacksonville, Florida. Bessie had completed payments on her own plane, a Curtiss JN-4 in Dallas, Texas and had it flown to Jacksonville in preparation for an air show. Bessie and her mechanic, William Wills was flying the plane in a test run, but Bessie had not put on her seatbelt, and in a mere ten minutes into the flight the plane did not pull out of a dive, malfunctioned and crashed. Bessie was thrown from the plane and died instantly when she hit the ground. Wills died on impact when the plane plummeted to the ground and burst into flame. Thousands attended her funerals in both Jacksonville and Orlando Florida. On her last journey in Chicago an estimated 10,000 people paid homage to Bessie. HONORS AND RECOGNITION All honors were her due. Recognition flooded in citing Elizabeth “Bessie” Coleman for her bravery, her accomplishment as the first African-American woman and the first woman to become an aviation pioneer. A second-floor conference room is named after her at Federal Aviation Administration, Washington, D.C. Chicago’s Mayor Richard M. Daley in 1990 stepped up to the plate and renamed Old Mannheim Road at O’Hare International Airport “Bessie Coleman Drive,” and in 1992, he proclaimed May 2, “Bessie Coleman Day in Chicago.” She was honored with her image on a U.S. postage stamp in 1995 and was inducted into the Women in Aviation Hall of Fame the same year. Yet another honor followed in 2000 when she was inducted in The Texas Aviation Hall of Fame. Look for her name on buildings in Harlem. ALTHOUGH ELIZABETH BESSIE COLEMAN DID NOT LIVE LONG ENOUGH TO FULFILL HER GREATEST DREAM, TO ESTABLISH A FLIGHT SCHOOL, HER MANY FANS, FRIENDS AND SUPPORTERS ASSURED ITS CREATION. THE BESSIE COLEMAN AERO CLUB WAS ESTABLISHED IN LOS ANGELES IN 1929 SPEARHEADED BY LIEUTENANT WILLIAM J. POWELL, WHO HAD SERVED IN A SEGREGATED UNIT DURING WORLD WAR I. HE TIRELESSLY PROMOTED THE CAUSE OF BLACK AVIATION AND SUBSEQUENTLY BESSIE COLEMAN AERO CLUBS SPRANG UP THROUGHOUT THE COUNTRY.